I ordered my sails in early December and got this picture of the finishing touches being applied from the loft. I ordered sails from Doyle Sails in San Francisco. 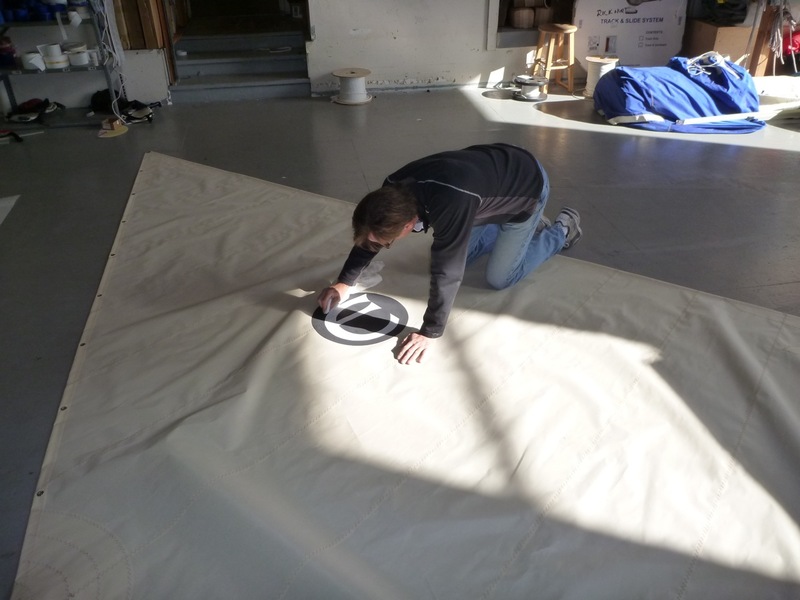 Bill Colombo, is putting the finishing touches on the mainsail. I’ll second Mark’s comment – I’ve watched this build very closely – and I’m still amazed at how clean and tidy your work space is. How is it that if I saw one piece of wood my wife complains about the sawdust in the farthest part of the house. Hi Allan Well, the reason I have been working on Alice Gale for 17 months is because 4 months of the time was for clean up. One of the deals I made with my wife Gail was to keep a space open for her car in the garage. I would use her car space during the day for boat building and then clean up each afternoon before she returned from work. This has kept my garage fairly clean, and this is when I usually do my photography. Also, while Gail is still working, I am the chief house cleaner too! So I have become pretty good at keeping both the garage and house tidy. Thanks for your kind words Mark. I have been pretty active with the build since the holidays. I still have much to do! I need to finish the rudder, shape the steel center board, and make all of my spars. Right now I am working on a change in seat design. A new blog post will be coming soon showing my progress. Once I get the interior finished, it will be lifted onto the trailer and then I will start the mast and spar construction. I hope for a spring launch but I have not set any deadlines.